James Edward Harden Jr. (born August 26, 1989) is an American professional basketball player for the Houston Rockets of the National Basketball Association (NBA). He played college basketball for Arizona State, where he was named a consensus All-American and Pac-10 Player of the Year in 2009. Harden was selected with the third overall pick in the 2009 NBA draft by the Oklahoma City Thunder. In 2012, he was named NBA Sixth Man of the Year with the Thunder and helped the team reach the NBA Finals. Harden was traded to Houston before the 2012–13 NBA season. With the Rockets, he became one of the NBA's most prolific scorers and earned recognition as the best shooting guard in the NBA, as well as one of the top overall players in the league. Harden was named the NBA Most Valuable Player in 2018. He is a seven-time NBA All-Star, and has earned All-NBA Team honors five times, including four times to the first team. For other people named James Harden, see James Harden (disambiguation). Harden attended Artesia High School in Lakewood, California. In his sophomore year, he averaged 13.2 points as Artesia went 28–5. He improved his stats to 18.8 points, 7.7 boards and 3.5 assists in his junior season and led Artesia to the California state title and a 33–1 record. Artesia repeated as state champions in Harden's final year after going 33–2. Harden had similar stats as during the previous season: 18.8 points, 7.9 rebounds, and 3.9 assists. He was named a McDonald's All-American, and also earned second-team Parade All-American honors. Harden's freshman year, Arizona State was picked to finish ninth in the Pac-10 Conference. Behind his 17.8 points, 5.3 rebounds and 3.2 assists per game, the Sun Devils went 21–13 (9–9) and finished tied for fifth in the Pac-10. They were considered a bubble team for the 2008 NCAA Tournament. Left out of the tournament, they were selected to the 2008 NIT field and defeated Alabama State and Southern Illinois before falling to defending national champion Florida. After his freshman year, Harden was named first team All-Pac-10 and was named to the conference all-freshman team. He was also named first team All-District by the NABC and the USBWA. Entering his sophomore year, Harden appeared on many pre-season All-American lists and on the cover of the Sports Illustrated college basketball preview issue. He was named to the Wooden Award preseason watch list. On November 30, 2008, Harden scored a career-high 40 points in an 88–58 victory over UTEP. Harden finished his sophomore campaign with averages of 20.1 points, 5.6 rebounds, and 4.2 assists. He was named to the 2009 All-Pac 10 Tournament Team following Arizona State's defeat by USC at the Staples Center. Following the conference season, Harden was named the Pacific-10 Conference's Player of the Year. He was also named a consensus All-American. After the conclusion of the season (a second-round NCAA tournament loss to Syracuse), Harden declared for the 2009 NBA draft. He employed Rob Pelinka as his agent. Harden was selected with the third overall pick in the 2009 NBA draft by the Oklahoma City Thunder. He recorded the fourth highest 3-point percentage in NBA history (.375) for a player under the age of 21 (min. of 150 attempts) during the 2009–10 season. He connected on seven straight 3-point field goals over two games (November 18 and 20), recording the most consecutive 3-point makes by a rookie since Houston guard Michael Dickerson made eight straight in May 1999. He posted a season-high 26 points against the Golden State Warriors on December 7, 2009. He was subsequently named to the NBA All-Rookie Second Team. During the 2010–11 season, he scored 10-plus points on 54 occasions, including a season-high 26 points against the Phoenix Suns on March 6, 2011. Harden averaged 16.8 points, 4.1 rebounds and 3.7 assists in 62 games (two starts) during the lockout-shortened 2011–12 season, as he received the NBA Sixth Man of the Year Award. He scored in double-figures in all but four of his appearances during the season. He scored a season-high 40 points against Phoenix on April 18, 2012, becoming the first NBA player in a reserve role to score 40 points since Dallas guard Rodrigue Beaubois in March 2010. Harden helped the Thunder reach the 2012 NBA Finals, where they were defeated in five games by the Miami Heat. During the 2012 free agency period, Oklahoma City attempted to sign Harden to a four-year contract extension worth between $52 and $55 million. Harden later contended that he was given too little time to consider the offer. 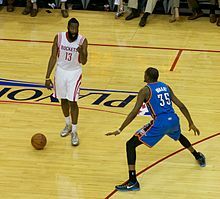 Harden (left) and Kevin Durant during the 2013 NBA playoffs. After failing to agree on a contract extension with the Thunder, Harden was traded to the Houston Rockets on October 27, 2012, along with Daequan Cook, Cole Aldrich and Lazar Hayward, in exchange for Kevin Martin, Jeremy Lamb, two first round picks (which became Steven Adams in 2013 and Mitch McGary in 2014), and a second round pick (which became Álex Abrines in 2013). Rockets general manager Daryl Morey called Harden a "foundational" player and expected him to be Houston's featured player despite previously only playing a supporting role behind Kevin Durant and Russell Westbrook. On October 31, 2012, Harden signed a contract extension with the Rockets for five years worth $80 million. That same day, he became the first-ever NBA player to score 37 or more points while registering a double-digit assist total in his team debut, posting 37 points, a career-high 12 assists, six rebounds, four steals and one block in a 105–96 win over the Detroit Pistons. He became just the fourth NBA player in the last 25 years to post those totals in a single game and matched the third-highest point total for any NBA player in his team debut (most for Rockets debut). Two days later, he scored 45 points against the Atlanta Hawks. His 82 total points were the most scored by a player in his first two games with a team in NBA history, surpassing the previous mark held by Wilt Chamberlain, who scored 79 points in his first two career games with the Philadelphia Warriors in 1959. He registered the first triple-double of his career on February 2, 2013 against the Charlotte Bobcats, recording 21 points, 11 rebounds and 11 assists. Harden was named as a reserve for the 2013 NBA All-Star Game, marking his first All-Star selection. He recorded 15 points, six rebounds and three assists in a 143–138 win by the West over the East. On February 20, 2013, Harden scored a career-high 46 points in a 122–119 win over his former team, the Oklahoma City Thunder. Harden had one of the greatest statistical seasons in team history in his first campaign with Houston. He averaged 25.9 points (fifth-best in the NBA), 4.9 rebounds and 5.8 assists in 78 games (all starts), becoming just the fifth player in team history to reach 2,000 points in one campaign (2,023 points). He surpassed Moses Malone's team mark for free throws made in a season (630 FTM in 1981–82), joining Malone as the only two Rockets players to ever reach 600 free throws made in a single season. Harden joined Gilbert Arenas (2005–06 and 2006–07), Kobe Bryant (2005–06 and 2007–08) and Jerry Stackhouse (2000–01) as the only four players in NBA history to record at least 600 free throws made and hit 150 or more 3-pointers in one season. Harden joined Tracy McGrady (four times in 2004–05) and Hakeem Olajuwon (three times in 1992–93) as the only Rockets to ever capture Player of the Week honors three or more times in one season. He was named to the 2012-13 All-NBA Third Team, marking his first career All-NBA Team selection while becoming just the seventh player in Rockets history to earn All-NBA recognition. Harden was selected by the head coaches as a reserve for the 2014 NBA All-Star Game, which marked his second consecutive All-Star selection. He was later named as a replacement starter for the All-Star Game, where he recorded eight points, five assists, one rebound and one steal in 23:46 of action. He was twice named Western Conference Player of the Week during the season, both coming in consecutive weeks (February 24 – March 2; March 3–9). He became the first Rockets player ever to pick up Player of the Week honors in consecutive weeks in the same season. On December 26, 2013 against the Memphis Grizzlies, Harden became the first player in NBA history to register at least 27 points on two or fewer field goals made (2-9 FG), finishing with a career-best 22-of-25 from the stripe and tying the Rockets single-game record for free throws made (22-27 FT by Sleepy Floyd in February 1991). On February 5, 2014 against the Phoenix Suns, Harden played in his 120th game with Houston, scoring 23 points on 12-for-12 from the foul line to become just the third player to score at least 3,000 points in his first 120 games played with the Rockets, joining Elvin Hayes (3,320) and Tracy McGrady (3,056). On February 25, 2014, he scored a season-high 43 points in a 129–103 win over the Sacramento Kings. At the season's end, he earned All-NBA First Team honors. Over the first two months of the season, Harden was in MVP contention. On December 11, 2014, he scored a season-high 44 points in a 113–109 overtime win over the Sacramento Kings. On December 13, 2014, he recorded his third career triple-double with 24 points, 10 assists and 10 rebounds in a 108–96 win over the Denver Nuggets. On December 22, 2014, he tied his season high with 44 points in a 110–95 win over the Portland Trail Blazers. On January 19, 2015, Harden set a new season high with 45 points against the Indiana Pacers. He tied that mark with 45 points against the Trail Blazers on February 8, 2015. On February 23, 2015, he recorded his second triple-double of the season with 31 points, 11 rebounds and 10 assists in a 113–102 win over the Minnesota Timberwolves. On March 6, 2015, he recorded his third triple-double of the season with 38 points, 12 rebounds and 12 assists in a 103–93 win over the Detroit Pistons. On March 19, 2015, he scored a career-high 50 points against the Denver Nuggets. He topped that mark with 51 points against the Kings on April 1, 2015. It was his 33rd 30-point game of the season and his ninth 40-point game of the season. He became the first player in franchise history to have two 50-point games in a season. Four days later, he had 41 points against the Oklahoma City Thunder for his 10th 40-point game of the season. In the Rockets' regular season finale on April 15, Harden recorded his fourth triple-double of the season with 16 points, 11 rebounds and 10 assists in a 117–91 win over the Utah Jazz. He helped the Rockets win their first division title since 1994 and clinched the No. 2 seed in the Western Conference. Harden was again named to the All-NBA First Team, and finished second in the NBA MVP voting behind Stephen Curry. Harden was later voted the inaugural National Basketball Players Association's MVP for the 2014–15 season. In Game 5 of the Rockets' second round playoff series against the Los Angeles Clippers, Harden recorded his first career playoff triple-double with 26 points, 11 rebounds and 10 assists. In Game 4 of the Western Conference Finals against the Golden State Warriors, Harden scored a playoff career-high 45 points. In Game 5 of the Western Conference Finals, Harden had a forgettable finale, with a playoff-record 13 turnovers and 14 points on 2-of-11 shooting. Harden scored 43 points against the Sacramento Kings on November 6, followed by 46 points against the Los Angeles Clippers the next night. He subsequently became the first Rocket to score 43-plus points in consecutive games since Malone had two streaks of three games doing so during the 1981–82 season. On November 18, head coach Kevin McHale was fired after the Rockets began the season with a 4–7 record. Later that night, Harden scored 45 points in a 108–103 overtime win over the Portland Trail Blazers. On November 27, he scored 50 points in a 116–114 win over the Philadelphia 76ers. Harden was 14 for 28 from the field and 16 for 20 at the line in his third career game with 50 or more points. On January 20, Harden had his first triple-double of the season and seventh of his career with 33 points, a career-high 17 rebounds and 14 assists in a 123–114 loss to the Detroit Pistons. He became the first player to have at least 33 points, 17 rebounds and 14 assists in a game since Wilt Chamberlain had 53 points, 32 rebounds and 14 assists for Philadelphia in March 1968. On January 24, he recorded his second triple-double of the season with 23 points, 15 rebounds and 10 assists in a 115–104 win over the Dallas Mavericks. On March 25, he recorded his third triple-double of the season with 32 points, 13 assists and 11 rebounds in a 112–109 win over the Toronto Raptors. Harden finished March with 457 points, 152 assists and 102 rebounds, becoming the first player to record at least 450 points, 150 assists and 100 rebounds in a single month since Oscar Robertson did it in December 1967. Harden finished the 2015–16 season with 374 turnovers, besting Artis Gilmore's mark of 366 in 1977–78, the first season the NBA recorded turnovers. Harden set career marks in points (29), assists (7.5) and rebounds (6.1) to join LeBron James, Michael Jordan and Oscar Robertson as the only players in NBA history to average at least 29 points, seven assists and six rebounds in a season. On July 9, 2016, Harden signed a four-year, $118.1 million contract extension with the Rockets. In September 2016, new Rockets head coach Mike D'Antoni announced that Harden would take on the point guard role to begin the 2016–17 season. In the Rockets' season opener on October 26, Harden had 34 points, a career-high 17 assists and eight rebounds in a 120–114 loss to the Los Angeles Lakers, becoming just the second player in NBA history to record at least 30 points and 15 assists in an opener—Tim Hardaway had 32 and 18 for the Golden State Warriors in 1990. On December 14, he recorded 15 points, 14 assists and 11 rebounds in just three quarters to lead the Rockets to a 132–98 win over the Sacramento Kings. It was Harden's fifth triple-double of the season and the 14th of his career, tying him with Hakeem Olajuwon for most in franchise history. He set the franchise record two days later with his sixth triple-double of the season and 15th of his career. In the Rockets' 122–110 win over the New Orleans Pelicans, Harden helped the team set an NBA-record with 24 three-pointers, as he finished with 29 points, 11 rebounds and 13 assists. On December 23, he tied a career high with 17 assists in a 115–109 loss to the Memphis Grizzlies. On December 30, he recorded his seventh triple-double of the season with 30 points, 13 rebounds and 10 assists in a 140–116 win over the Los Angeles Clippers. On December 31, 2016, Harden recorded yet another triple-double with 53 points, 17 assists and 16 rebounds in a 129–122 win over the New York Knicks, becoming the first player in NBA history to finish with a 50-15-15 stat line. He tied Wilt Chamberlain for the most points in a triple-double in NBA history—Chamberlain pulled the feat during the 1967–68 season, with 53 points, 32 rebounds and 14 assists. Harden set career highs for points and three-pointers (with nine) and matched his career best for assists. It was his 17th career triple-double and his fourth career 50-point game. Two days later, he recorded his ninth triple-double of the season in a win over the Washington Wizards and was named Western Conference Player of the Week for a third time. It was Harden's 12th Player of the Week honor, matching Hakeem Olajuwon for the most Player of the Week awards in franchise history. Harden's career-best December run earned him Western Conference Player of the Month honors. His 10th and 11th triple-doubles came in back-to-back games on January 8 and 10, both resulting in wins. His two performances saw him become the fourth player in NBA history with at least 40 points, 10 rebounds and 10 assists in consecutive games—Pete Maravich, Michael Jordan and Russell Westbrook are the three others to do it. His 12th and 13th triple-doubles came in back-to-back games on January 15 and 17. On January 27, he recorded his 14th triple-double of the season with 51 points, 13 rebounds and 13 assists in a 123–118 win over the Philadelphia 76ers, becoming the first player in NBA history with multiple 50-point triple-doubles in a season. On February 3 against the Chicago Bulls, Harden scored his 10,000th point as a Rocket, passing Yao Ming for sixth place in franchise history. On February 11, he scored 40 points in three quarters (his ninth 40-point game of the season) to help the Rockets win 133–102 over the Phoenix Suns. He played just 29 minutes against the Suns to become the first Rockets player since Sleepy Floyd in 1991 to score 40 points in less than 30 minutes. On February 15, he recorded his 15th triple-double of the season with 38 points 12 rebounds and 12 assists in a 117–109 loss to the Miami Heat. Between March 12 and 18, he had four straight triple-doubles, giving him 19 for the season. He finished the regular season with 22 triple-doubles and became the first player in NBA history to finish the regular season with at least 2,000 points (2,356), 900 assists (907) and 600 rebounds (659). He placed second in league MVP voting to former teammate Westbrook. In Game 5 of the Rockets' second round playoff series against the San Antonio Spurs, Harden recorded his second career postseason triple-double with 33 points, 10 rebounds and 10 assists in a 110–107 overtime loss; the loss saw the Rockets go down 3–2 in the series. The Rockets were eliminated by the Spurs with a 114–75 loss in Game 6. Harden capped his stellar season by tying a season low with 10 points on 2-of-11 shooting before fouling out with 3:15 left. On July 8, 2017, Harden signed a four-year contract extension with the Rockets for approximately $160 million, giving him a total six-year deal with $228 million guaranteed—the richest contract in NBA history. The deal will keep Harden the face of the Rockets through the 2022–23 season. On November 5, he scored a career-high 56 points in a 137–110 win over the Utah Jazz, falling just shy of Calvin Murphy's 57-point franchise record set in 1978. Harden joined Wilt Chamberlain as the only players in NBA history to have at least 10 assists and shoot better than 75 percent from the field in a 50-point performance. On November 16, he had 23 of his 48 points in the second quarter while the Rockets scored 90 points in the first half en route to a 142–116 win over the Phoenix Suns. The Rockets made 61 percent of their first-half shots to get the second-most points in a first half in NBA history. He went on to become the first player in team history to score at least 20 points in each of the team's first 20 games of a season. Harden was named Western Conference Player of the Month for games played in October and November, marking the fifth time Harden has received the honor, all coming as a Rocket. On December 9, he scored 48 points to help the Rockets rally from a 14-point, fourth-quarter deficit to beat the Portland Trail Blazers 124–117, scoring at least 20 points in each of Houston's 24 games, becoming only the second player to accomplish such a feat since the 1990–91 season. On December 20, despite Harden's 51 points, the Rockets were defeated 122–116 by the Los Angeles Lakers, ending their 14-game winning streak. Harden set a franchise record by scoring at least 20 points in his 30th straight game. The previous record was held by Malone, who did it in 29 straight games in the 1981–82 season. Two days later, Harden had a second straight 51-point performance in a 128–118 loss to the Los Angeles Clippers. It was Harden's third 50-point game of the season and he became the first player in franchise history to have two straight 50-point games. He also became the first NBA player to score 50 or more in consecutive games since Kobe Bryant did so in four straight in March 2007. On December 31 against the Lakers, Harden scored 40 points before leaving with a hamstring injury late in the fourth quarter. Without Harden, the Rockets won 148–142 in double overtime. The following day, he was ruled out for two weeks with a Grade 2 hamstring strain. He missed seven games as a result. On January 26, he had 23 points and 11 assists in a 115–113 loss to the New Orleans Pelicans. Harden moved into second in Rockets history in assists with 3,347, passing Allen Leavell's 3,339. On January 30, in a 114–107 win over the Orlando Magic, Harden became the first player in NBA history to score 60 points as part of a triple-double, finishing with 10 rebounds and 11 assists for his third triple-double of the season. Harden scored 18 points in the fourth quarter to eclipse the 57 points Calvin Murphy scored in 1978 to break Houston's single-game scoring record. It was his fourth 50-point game of the season and bested his previous career high of 56 points set in November against Utah. On March 25, he helped the Rockets reach 60 wins in a season for the first time in franchise history, recording a triple-double (fourth of season, 35th of career) with 18 points, 15 assists and 10 rebounds in three quarters in a 118–99 win over the Atlanta Hawks. The Rockets finished the regular season as the No. 1 seed for the first time in franchise history, with a franchise-best 65–17 record. Harden won his first scoring title, averaging 30.4 points per game, second in franchise history to Malone's 31.1 in 1981–82. In Game 1 of the Rockets' first-round playoff series against the Minnesota Timberwolves, Harden scored 44 points in a 104–101 win. In Game 1 of their second-round series against the Jazz, Harden scored 41 points in a 110–96 win. It was his sixth 40-point playoff game of his career. In Game 1 of the Western Conference Finals, Harden scored 41 points in a 119–106 loss to the Golden State Warriors. In Game 4 against the Warriors, Harden scored a game-high 30 points to help the Rockets even the series at 2–2 with a 95–92 win. In Game 6, he recorded 32 points, nine assists and seven rebounds in a 115–86 loss. Despite a 32-point effort from Harden in Game 7, the Rockets were eliminated from the playoffs with a 101–92 defeat. In June, Harden was named the NBA Most Valuable Player for the 2017–18 season, becoming the third player in franchise history to receive the award, joining Moses Malone (1978–79 and 1981–82) and Hakeem Olajuwon (1993–94). That same month, he was voted the National Basketball Players Association's MVP for the 2017–18 season, earning the honor for a second time. The Rockets started the season with a 4–7 record, while Harden missed three early games with a strained left hamstring. By late November, he had moved past Rudy Tomjanovich (13,383) into third place on the team's all-time scoring list. On November 26, he scored a season-high 54 points to go with 13 assists and 11 turnovers in a 135–131 overtime loss to the Washington Wizards. On November 28, he had his first triple-double of the season and 36th of his career with 25 points, 17 assists and 11 rebounds in a 128–108 loss to the Dallas Mavericks. On December 8, the Rockets fell to 11–14 following another loss to the Mavericks. It was their seventh loss in nine games following a season-best five-game winning streak. By the end of December, Harden had carried the Rockets to a 21–15 record with fellow All-Star Chris Paul out with a hamstring injury. On January 11, he had 43 points, 10 rebounds and 12 assists in three quarters to lead the Rockets to a 141–113 win over the Cleveland Cavaliers. He also made eight 3-pointers to extend his NBA record to 12 games in a row with at least five. It was Harden's 13th game of the season with 40 points, surpassing Malone's franchise record, and his seventh in the previous nine games as he continued to carry the team with Paul and Eric Gordon out with injuries. 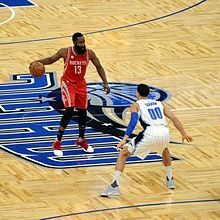 In the following game on January 13, Harden scored 38 points but was just 1 for 17 on 3-point attempts in a 116–109 loss to the Orlando Magic. On January 14, he scored 57 points in a 112–94 win over the Memphis Grizzlies. On January 16, he scored 58 points in a 145–142 overtime loss to the Brooklyn Nets. On January 23, he scored a career-high 61 points to go with 15 rebounds in a 114–110 win over the New York Knicks, thus setting the fourth-longest streak for 30-point games in NBA history at 21—at the time, Wilt Chamberlain held the three longer streaks (65, 31 and 25). With 37 points on January 29 against the New Orleans Pelicans, Harden extended his streak of 30-point games to 24 and had his 11th straight game with at least 35 points. With 30 points against the Denver Nuggets on February 1 and 43 points against the Utah Jazz on February 2, Harden set the third-longest streak in NBA history for games with 30-plus points. With 42 points against the Minnesota Timberwolves on February 13, Harden scored 30 or more points for the 31st consecutive game, tying Chamberlain for the second-longest streak in league history. On February 21, in the Rockets' first game after the All-Star break, Harden scored 30 points against the Los Angeles Lakers for his 32nd consecutive game with 30-plus points. After missing the Rockets' next game with an illness and a strained neck, his return game on February 25 saw him score 28 points against the Atlanta Hawks, snapping his 32-game streak with at least 30. Standing at 6 feet 5 inches tall (1.96 m) in shoes and weighing 220 pounds (100 kg), Harden plays mostly at the shooting guard position. With season averages of over 26 points per game since the 2012–13 season, Harden is considered one of the most versatile and dangerous scorers in the NBA. He possesses a wide array of offensive moves; two of the most prominent among them being his Euro step and his step-back jumper. He has also gained notoriety for his ability to exploit league rules in order to more efficiently draw fouls and get to the free throw line, from which he is a career 84.9% shooter. He has led the NBA in free throw attempts and makes every year since the 2014–15 season. Though primarily a scorer, he is also known for his playmaking ability, orchestrating the Rockets' offense with his elevated assist numbers. During the early portion of the 2016–17 season, Rockets head coach Mike D'Antoni played Harden at point guard, which resulted in him averaging over 10 assists per game for the first time in his career. While he has garnered acclaim for his prowess on the offensive end, Harden has built a reputation as a poor defender. Criticism of his defense intensified in early 2014, when a video titled "James Harden: Defensive Juggernaut" featuring eleven minutes worth of clips of Harden conceding field goals, was circulated on the Internet. During the 2014 offseason, he committed to an improvement on defense, which manifested as early as August of that year as a member of the United States men's national basketball team. His improved defense carried over to the following season, and has been cited as a major reason for the Rockets' regular season success. Another negative aspect of his game that is sometimes brought up by pundits are his turnovers. Harden set the NBA record for turnovers during the 2015–16 season and broke it again the following season. Harden was a member of the United States national team that won a gold medal at the 2012 Olympics, and was also a member of the team that won the FIBA Basketball World Cup in 2014. Harden was a candidate for the 2016 Olympics, but he withdrew from the team. Harden is a Christian. He has talked about his faith, saying, "I just want to thank God for everything he has done in my life." Harden started growing his trademark beard in 2009 after being too lazy to shave. His beard has appeared in songs and on T-shirts. On August 3, 2015, the sports apparel company Adidas submitted an endorsement deal to Harden worth $200 million over the next 13 years. ↑ "2015-16 GM Survey". Nba.com. Retrieved June 28, 2017. ↑ "Harden stands out among pack of top shooting guards". Nba.com. Retrieved June 28, 2017. ↑ "#NBArank: LeBron, Davis headline top five". Espn.go.com. October 27, 2015. Retrieved June 28, 2017. ↑ "Sorting Out A Zillion Players In Vegas". Hsoregon.scout.com. July 27, 2006. Retrieved June 28, 2017. ↑ "UCLA Picked To Defend Pac-10 Title in 2007–08". Archived from the original on June 18, 2009. Retrieved March 7, 2008. ↑ "Pac-10 All-Tournament Team". Archived from the original on August 2, 2009. Retrieved March 15, 2009. ↑ Haller, Doug (March 9, 2009). "Harden named Pac-10 Player of Year". Azcentral.com. Retrieved August 4, 2012. ↑ "James Harden Declares Entry to NBA Draft". Archived from the original on April 20, 2009. Retrieved December 28, 2015. ↑ "James Harden". DraftExpress LLC. Retrieved May 12, 2009. ↑ "James Harden 2009-10 Game Log". Basketball-Reference.com. Retrieved December 18, 2017. 1 2 3 4 5 6 7 8 "James Harden stats, details, videos, news". NBA.com. December 17, 2017. ↑ "Thunder's James Harden wins Kia Sixth Man Award". NBA.com. May 10, 2012. Retrieved December 17, 2017. ↑ Windhorst, Brian (October 28, 2012). "Heat: OKC deal alters West balance". ESPN. Archived from the original on October 29, 2012. 1 2 Mayberry, Darnell (October 27, 2012). "Oklahoma City Thunder trades James Harden to Houston". newsok.com. Archived from the original on October 29, 2012. 1 2 "James Harden: Behind The Beard | E:60". YouTube.com. ESPN. April 18, 2017. Retrieved April 21, 2017. ↑ "GM: James Harden is 'foundational'". ESPN. October 29, 2012. ↑ "James Harden gets $80 million". ESPN. Associated Press. November 1, 2012. Archived from the original on November 1, 2012. ↑ "Notebook: Rockets 109, Bobcats 95". NBA.com. February 2, 2013. Retrieved December 17, 2017. ↑ "Notebook: Rockets 122, Thunder 119". NBA.com. February 20, 2013. Retrieved December 17, 2017. ↑ "Notebook: Rockets 129, Kings 103". NBA.com. February 25, 2014. Retrieved December 17, 2017. ↑ "Durant, LeBron headline 2013-14 All-NBA First Team". NBA.com. June 4, 2014. Retrieved December 17, 2017. ↑ Patt, Jason (December 23, 2014). "James Harden keeps making his case for MVP". sbnation.com. Retrieved December 17, 2017. ↑ "Harden scores 44 to lead Rockets over Kings in OT". NBA.com. December 11, 2014. Retrieved December 17, 2017. ↑ "Howard, Harden lead Rockets over Nuggets, 108-96". NBA.com. December 13, 2014. Retrieved December 17, 2017. ↑ "Harden's 44 lead Rockets over Blazers, 110-95". NBA.com. December 22, 2014. Retrieved December 17, 2017. 1 2 3 4 5 "James Harden 2014-15 Game Log". Basketball-Reference.com. Retrieved December 17, 2017. ↑ "Harden's triple-double helps Rockets over Wolves, 113-102". NBA.com. February 23, 2015. Retrieved December 17, 2017. ↑ "Harden's triple-double leads Rockets over Pistons 103-93". NBA.com. March 6, 2015. Retrieved December 17, 2017. ↑ "Harden's career-high 51 lead Rockets over Kings 115-111". NBA.com. April 1, 2015. Retrieved December 17, 2017. ↑ "Harden has triple-double, Rockets beat Jazz 117-91". NBA.com. April 15, 2015. Retrieved December 17, 2017. ↑ "Warriors' Curry and Cavaliers' James unanimous picks for 2014-15 All-NBA First Team". NBA.com. May 21, 2015. Retrieved December 17, 2017. ↑ "Warriors' Stephen Curry wins 2014-15 Kia NBA Most Valuable Player Award". NBA.com. May 4, 2015. Retrieved December 17, 2017. ↑ "James Harden, not Steph Curry, wins MVP at first NBPA Awards". foxsports.com. July 22, 2015. Retrieved December 17, 2017. ↑ "Houston avoids elimination with 124-103 win over Clippers". NBA.com. May 12, 2015. Retrieved December 17, 2017. ↑ "Harden helps Rockets stay alive, beat Warriors 128-115". NBA.com. May 25, 2015. Retrieved December 17, 2017. ↑ "Warriors eliminate Rockets, end 40-year NBA Finals drought". NBA.com. May 27, 2015. Retrieved December 17, 2017. ↑ "James Harden Named Western Conference Player of the Week". NBA.com. November 9, 2015. Retrieved December 17, 2017. ↑ "Harden, Rockets pull out OT win after firing McHale". NBA.com. November 18, 2015. Retrieved December 17, 2017. ↑ "Harden scores 50 as Rockets beat winless 76ers 116-114". NBA.com. November 27, 2015. Retrieved December 17, 2017. ↑ "Caldwell-Pope scores 22 as Pistons beat Rockets 123-114". NBA.com. January 20, 2016. Retrieved December 17, 2017. ↑ "Harden's triple-double leads Rockets over Mavericks 115-104". NBA.com. January 24, 2016. Retrieved December 17, 2017. ↑ "Harden's triple-double leads Rockets over Raptors 112-109". NBA.com. March 25, 2016. Retrieved December 17, 2017. ↑ "Mirotic scores 28 as Bulls edge Rockets 103-100". NBA.com. March 31, 2016. Retrieved December 17, 2017. ↑ "NBA & ABA Single Season Leaders and Records for Turnovers". Basketball-Reference.com. Retrieved April 8, 2016. ↑ "James Harden now holds the NBA record for most turnovers in a season". hoopshype.com. April 11, 2016. Retrieved December 17, 2017. ↑ "Rockets clinch playoff berth with 116-81 win over Kings". NBA.com. April 13, 2016. Retrieved December 17, 2017. ↑ "Rockets Sign James Harden to Four-Year Contract Extension". NBA.com. July 9, 2016. Retrieved July 9, 2016. ↑ Watkins, Calvin (July 9, 2016). "James Harden signs new contract with Houston Rockets". ESPN. Retrieved July 9, 2016. 1 2 "James Harden changes positions for Houston Rockets". ESPN.com. September 26, 2016. Retrieved October 27, 2016. 1 2 "James Harden Will Play as Houston Rockets' Full-Time Point Guard". bleacherreport.com. September 26, 2016. Retrieved October 27, 2016. ↑ "Young Lakers roar past Rockets 120-114 to win Walton's debut". ESPN.com. October 26, 2016. Retrieved October 27, 2016. ↑ "Harden's triple-double helps Houston to 8th straight win". ESPN.com. December 14, 2016. Retrieved December 15, 2016. ↑ "Rockets make NBA-record 24 3-pointers, beat Pelicans 122-100". ESPN.com. December 16, 2016. Retrieved December 17, 2016. ↑ "Conley scores 24 points, Grizzlies beat Rockets 115-109". ESPN.com. December 23, 2016. Retrieved December 23, 2016. ↑ "James Harden has triple-double, Rockets top Clippers 140-116". ESPN.com. December 30, 2016. Retrieved December 30, 2016. ↑ Golliver, Ben (January 1, 2017). "James Harden Hangs Historic 53-Point Triple-Double On New Year's Eve". SI.com. Retrieved January 1, 2017. ↑ "James Harden scores 53, ties Wilt for most points in triple-double". ESPN.com. December 31, 2016. Retrieved December 31, 2016. 1 2 "Gordon, Harden lead Rockets to 101-91 win over Wizards". ESPN.com. January 2, 2017. Retrieved January 3, 2017. ↑ "John Wall, James Harden named Players of the Week". NBA.com. January 2, 2017. Retrieved January 3, 2017. ↑ "John Wall, James Harden named Kia Players of the Month". NBA.com. January 3, 2017. Retrieved January 4, 2017. ↑ "Harden powers Rockets past Raptors for 8th straight win". ESPN.com. January 8, 2017. Retrieved January 8, 2017. 1 2 "Harden's triple-double leads Rockets to 9th straight win". ESPN.com. January 10, 2017. Retrieved January 10, 2017. ↑ "Harden's 12th triple-double helps Rockets end 2-game skid". ESPN.com. January 15, 2017. Retrieved January 15, 2017. ↑ "Dragic scores 21 and Heat stun Rockets, 109-103". ESPN.com. January 17, 2017. Retrieved January 17, 2017. ↑ "James Harden scores 51 to lead Rockets past Joel Embiid, 76ers". ESPN.com. January 27, 2017. Retrieved January 27, 2017. ↑ "James Harden posts another historic triple-double". NBA.com. January 27, 2017. Retrieved January 27, 2017. ↑ "Harden scores 42, rallies Rockets past Bulls 121-117 in OT". ESPN.com. February 3, 2017. Retrieved February 3, 2017. ↑ "Harden's 40 leads Rockets over Suns 133-102". ESPN.com. February 11, 2017. Retrieved February 12, 2017. ↑ "Whiteside helps Heat beat Rockets 117-109". ESPN.com. February 15, 2017. Retrieved February 16, 2017. ↑ "James Harden 2016-17 Game Log". Basketball-Reference.com. Retrieved March 18, 2017. ↑ "Harden's triple-double helps Rockets over Wolves 123-118". ESPN.com. April 12, 2017. Retrieved April 13, 2017. ↑ "Rockets' James Harden awarded NBA's MVP after career season". ESPN.com. Retrieved June 26, 2018. ↑ "Spurs overcome Leonard injury, Harden to beat Rockets in OT". ESPN.com. May 9, 2017. Retrieved May 9, 2017. ↑ "Spurs rout James Harden, Rockets 114-75 to win series". ESPN.com. May 11, 2017. Retrieved May 11, 2017. 1 2 Blinebury, Fran (July 9, 2017). "James Harden's record contract extension lays groundwork for 'super team' In Houston". NBA.com. Retrieved July 12, 2017. ↑ Krawczynski, Jon (July 8, 2017). "Houston Rockets sign James Harden to reported record contract extension". NBA.com. Retrieved July 8, 2017. 1 2 "Harden's career-high 56 lead Rockets past Jazz, 137-110". ESPN.com. November 5, 2017. Retrieved November 5, 2017. ↑ "Harden, Rockets get 90 in first half, beat Suns 142-116". ESPN.com. November 16, 2017. Retrieved November 16, 2017. ↑ "James Harden Makes Rockets History - 1st Player to Score 20+ in First 20 Games". YouTube.com. November 28, 2017. Retrieved November 29, 2017. ↑ "James Harden Sets Rockets Franchise Scoring Record with Electric Start to Season". bleacherreport.com. November 29, 2017. Retrieved November 29, 2017. ↑ "Harden Named Western Conference Player of the Month". NBA.com. December 1, 2017. Retrieved December 2, 2017. ↑ "James Harden scores 48 points, Rockets win 9th in row". ESPN.com. December 9, 2017. Retrieved December 10, 2017. ↑ "Kuzma, Lakers overcome Harden's 51 to end Rockets' streak". ESPN.com. December 20, 2017. Retrieved December 20, 2017. ↑ "Career night by Rivers leads Clippers over Rockets 128-118". ESPN.com. December 22, 2017. Retrieved December 23, 2017. ↑ "Paul helps Rockets to 148-142 win over Lakers in double OT". ESPN.com. December 31, 2017. Retrieved December 31, 2017. ↑ "James Harden Injury Update". NBA.com. January 1, 2018. Retrieved January 1, 2018. ↑ "Gordon scores 30 as Rockets beat Timberwolves 116-98". ESPN.com. January 18, 2018. Retrieved January 18, 2018. ↑ "Davis, Cousins help Pelicans hold off Rockets". ESPN.com. January 26, 2018. Retrieved January 26, 2018. 1 2 "Harden has first 60-point triple-double in NBA history". ESPN.com. January 30, 2018. Retrieved January 30, 2018. ↑ "Rockets beat Hawks 118-99 for 60th win". ESPN.com. March 25, 2018. Retrieved March 26, 2018. ↑ "Kings beat short-handed Rockets 96-83 in season finale". ESPN.com. April 11, 2018. Retrieved April 12, 2018. ↑ "Harden scores 44 points, Rockets beat Wolves 104-101". ESPN.com. April 15, 2018. Retrieved April 24, 2018. ↑ "Harden's 41 points lead Rockets over Jazz in Game 1". ESPN.com. April 29, 2018. Retrieved April 29, 2018. ↑ "Durant's 37 lead Warriors over Rockets 119-106". ESPN.com. May 14, 2018. Retrieved May 14, 2018. ↑ "Harden scores 30, Rockets even series at 2 games apiece". ESPN.com. May 22, 2018. Retrieved May 22, 2018. ↑ "James Harden Named NBA MVP". NBA.com. June 25, 2018. Retrieved June 25, 2018. ↑ Youngmisuk, Ohm (June 7, 2018). "Rockets' James Harden wins MVP in voting by peers". ESPN.com. Retrieved June 10, 2018. ↑ "Harden's 40 lifts Rockets to 1st home win 115-103 over Indy". ESPN.com. November 11, 2018. Retrieved November 11, 2018. ↑ "James Harden turns it on in second half as Rockets win second straight". ESPN.com. November 3, 2018. Retrieved November 11, 2018. Harden, the NBA's reigning MVP, had missed three games with a strained left hamstring. ↑ "Harden's 43 points leads Rockets over Pistons 126-124". ESPN.com. November 21, 2018. Retrieved November 21, 2018. ↑ "Wizards overcome Harden's 54, beat Rockets 135-131 in OT". ESPN.com. November 26, 2018. Retrieved November 27, 2018. ↑ "Doncic helps Mavs rout Rockets 128-108". ESPN.com. November 28, 2018. Retrieved November 28, 2018. ↑ "Doncic scores 11 straight, Mavs rally past Rockets, 107-104". ESPN.com. December 8, 2018. Retrieved January 1, 2019. ↑ "Harden's 43 points, triple-double lead Rockets over Memphis". ESPN.com. December 31, 2018. Retrieved January 1, 2019. 1 2 3 "Harden has triple-double to lead Rockets over Cavs 141-113". ESPN.com. January 11, 2019. Retrieved January 11, 2019. ↑ Dewald, Steve (January 12, 2019). "James Harden produces historic numbers in Rockets' win over Cavaliers". USA Today. Retrieved January 17, 2019. ↑ "Magic rally in fourth quarter to beat Rockets 116-109". ESPN.com. January 13, 2019. Retrieved January 13, 2019. ↑ "James Harden moves past Kobe with 17th straight 30-point game". NBA.com. January 14, 2019. Retrieved January 14, 2019. ↑ "Harden's 57 points lead Rockets over Grizzlies 112-94". ESPN.com. January 14, 2019. Retrieved January 15, 2019. ↑ "James Harden continues tear with 58, but Rockets fall in overtime to Nets". ESPN.com. January 16, 2019. Retrieved January 17, 2019. ↑ "Harden scores career-best 61, Rockets edge Knicks 114-110". ESPN.com. January 23, 2019. Retrieved January 24, 2019. ↑ "Okafor helps short-handed Pelicans beat Rockets 121-116". ESPN.com. January 29, 2019. Retrieved January 30, 2019. ↑ "James Harden extends 30-point streak to 25 games in loss to Nuggets". ESPN.com. February 1, 2019. Retrieved February 2, 2019. ↑ "Harden has 43 points for 26th game in a row with 30 or more". ESPN.com. February 2, 2019. Retrieved February 2, 2019. ↑ "T-Wolves overcome Harden's 42 to top Houston 121-111". ESPN.com. February 13, 2019. Retrieved February 14, 2019. ↑ "LeBron rallies Lakers to 111-106 victory over Rockets". ESPN.com. February 21, 2019. Retrieved February 22, 2019. ↑ "Without ill James Harden, Rockets hold off Warriors 118-112". ESPN.com. February 23, 2019. Retrieved February 25, 2019. ↑ "Harden's 30-point streak ends as Rockets beat Hawks 119-111". ESPN.com. February 25, 2019. Retrieved February 25, 2019. ↑ "Lakers Preview: 10 Things to Know About the Rockets". Nba.com. October 28, 2014. Retrieved June 28, 2017. ↑ "The Future of Basketball Is Here, and It Looks a Lot Like James Harden". Grantland.com. January 7, 2015. Retrieved March 14, 2015. ↑ Fansided (December 21, 2013). "Houston Rockets: James Harden's Unstoppable Step-Back Jumper". Chatsports.com. Retrieved June 28, 2017. ↑ "CourtVision: James Harden and the Amazing Technicolor Foul Shot". Grantland.com. January 7, 2015. Retrieved March 14, 2015. ↑ Richman, Mike (March 10, 2015). "Trail Blazers prepare for Houston Rockets, 'crafty' attack of James Harden". OregonLive.com. ↑ "Dwight Howard Injury Gives James Harden Chance to Swing NBA MVP Race". Bleacher Report. February 3, 2015. Retrieved March 14, 2015. ↑ "Here Are 11 Minutes of James Harden Playing Terrible, Awful Defense". Bleacher Report. April 18, 2014. Retrieved March 14, 2015. ↑ Winter, Jack (August 4, 2014). "Report: James Harden's Defense Impressing With Team USA". Uproxx.com. Retrieved June 28, 2017. ↑ "James Harden's Defense Keys Houston Rockets' Hot Start (No Really)". Bleacher Report. November 14, 2014. Retrieved March 14, 2015. ↑ Feldman, Dan (March 9, 2017). "James Harden breaks single-season turnover record". nbcsports.com. Retrieved March 26, 2017. ↑ "James Harden Bio, Stats, and Results". Sports-Reference.com. Retrieved August 5, 2018. ↑ James Harden [@JHarden13] (April 1, 2013). "RT @JLin7: "Death is swallowed up in victory" ... He is Risen! Happy Easter!!" (Tweet) – via Twitter. ↑ James Harden [@JHarden13] (May 20, 2012). "I thank GOD for everything!!!" (Tweet) – via Twitter. ↑ "James Harden Wanted Time to Pray Before Leaving OKC". ↑ Thamel, Pete (March 20, 2009). "James Harden's Style at Guard Masks His Ability at Arizona State". The New York Times. p. B13. Archived from the original on June 15, 2012. ↑ Beck, Howard (May 27, 2012). "Standing Out and Blending In". The New York Times. p. SP7. Archived from the original on June 15, 2012. Retrieved February 24, 2017. ↑ Kerby, Trey (December 20, 2011). "Get your very own James Harden beard thanks to this t-shirt". TheScore.com. Score Media Inc. Archived from the original on June 15, 2012. ↑ Rovell, Darren (August 3, 2015). "Adidas makes $200M bid to sign Rockets star James Harden". espn.go.com. ESPN. Retrieved August 4, 2015. Wikimedia Commons has media related to James Harden.